This practical text/reference provides a clear,systems-oriented approach to electro-optical system design. Covering electro-optical systems that are used for information processing,the book focuses on those systems that convey information via an electro-optical beam as in remote sensing,guidance and tracking,and fiber optic and laser communication systems. With 30% more pages,this book is a greatly expanded and revised version of the author's Radiometric System Design. Part I prepares the reader to direct and monitor the design of an electro-optical system. Part II gives detailed design considerations of the major subsystems introduced in Part I. 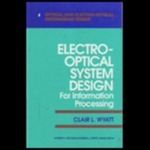 A volume in the Optical and Electro-Optical Engineering Series.